If you look at movies made in the ’60s, ’70s, and ’80s, the future was full of cars — albeit very technologically advanced ones. Movies like “Back to the Future” had us dreaming of flying cars with time-traveling capabilities. But at the time, many of these technologies were stuck in the realm of imagination. What about now? Are these cars real or still destined for the future? For those old enough to remember “The Jetsons,” an animated TV show following George Jetson and his family, it showed American viewers what the future could look like — including travel by flying car. In 1962, a flying car seemed like… well, a flight of fancy. But car technology and innovation have barreled forward in the fifty-six years since “The Jetsons” debuted. Flying cars are slowly becoming a reality. There are several companies — including Aston Martin, Uber and Terrafugia — that are bringing cars to the skies, to varying degrees of success. Uber is looking to the skies to avoid on-street traffic jams, while Terrafugia is focused on developing a plane-car hybrid. However, it will likely be a few years until everyday consumers can use them to get to and from work. Bond fans may remember the Lotus Esprit in “The Spy Who Loved Me.” It helped James Bond, played by Roger Moore, in the 1977 movie through a car chase on land and in water. The moviemakers did use a real Esprit — two, in fact — in the 007 film: One was a road-ready Esprit, while the second one was a functional submarine. While the submarine version of the Esprit couldn’t drive, it still became a hot collector’s item. A driver who had a spare $1 million, aka Elon Musk, thought it was a catch. Can we take cars underwater yet? Not quite. There are few examples of amphibious cars. The Lane Motor Museum is one of several places where drivers can experience amphibicars firsthand. The Boathouse in Orlando is another place where enthusiasts can enjoy amphibicars. While these vehicles are amazing, they’re designed to keep drivers above water, which makes us think true underwater cars will likely stay fictional… for now. 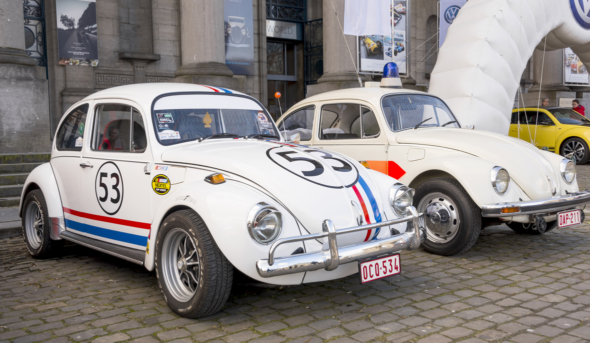 Herbie, a 1963 Volkswagen Beetle, raced onto the screen in 1968 in “The Love Bug.” Herbie had a mind of his own: He could drive himself as well as cause mischief on and off the racetrack. In fact, he could turn other Beetles into sentient cars, too! But it wasn’t artificial intelligence or LIDAR that gave Herbie his powers; it was pure movie magic. Fifty years later, automakers have used technology to turn Herbie into a reality. Car companies, including Ford and GM, are teaming up with tech giants like Google and Uber to develop self-driving technology. They are using LIDAR as well as machine learning to teach cars to navigate streets on their own. According to tech experts, these autonomous cars aren’t up to Herbie level yet: They can complete some tasks autonomously, but still require drivers to be alert in case something goes awry. In 1982, Knight Industries Two Thousand, shortened to KITT, served as the sidekick to Michael Knight in the TV show “Knight Rider.” The 1982 Pontiac Firebird could not only drive itself, it used AI to communicate with Knight. It even had a personality of its own. Artificial intelligence in cars is well on its way to becoming a full-fledged reality. At present, drivers can talk to Alexa, Siri or Google while behind the wheel (and in Alexa’s case, she can continue talking to you once you’re in the house). These programs can understand natural commands — and programmers are working to give these digital assistants a sense of humor, too. Transformers, which got their start as children’s toys, could turn everyday cars into larger-than-life robots. In 2007, Transformers got a reboot with the Michael Bay film franchise. Perhaps the most well known Transformer is Bumblebee. Originally a Yellow Volkswagen Beetle, the Michael Bay films revamped Bumblebee as a Chevy Camaro. Surely Transformers will always be fictional, right? Transformers are real. A team in Poland took a cherry red BMW 3 Series and transformed it into a functional robot. Even crazier, the robot can return to its car state and continue driving. Is there a futuristic car that didn’t make the list? What tech would love to see become a reality? This entry was posted in Car Industry News, Cars Coming Soon, Exotic Cars, General Chat, United States and tagged amphibicars, delorean, flying car aston martin, future cars, herbie the love bug, james bond underwater car, jetsons, self driving cars. Bookmark the permalink. Many concept cars have been true innovations, dream cars with a window onto the future. A lot of them are just darn cool looking, and it sure would be nice to see some of them made today. Absolutely. Is there one that really strikes your fancy?